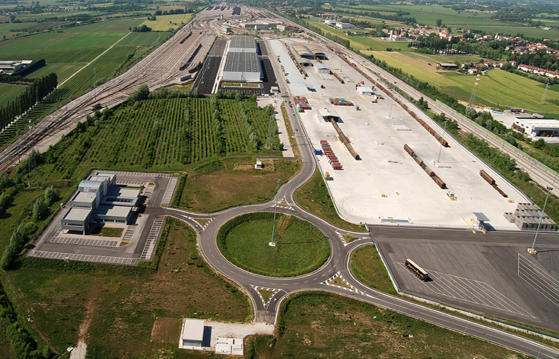 The Intermodal Terminal, adjacent to the Cervignano railway station, is located on the two multimodal corridors identified by the General Transport Plan. Cervignano, in fact, is located in a strategic position at the intersection of the Adriatic / Baltic Corridor that extends in a north-south direction connecting the southern regions with the northern ones and the Mediterranean Corridor which extends in an east-west direction, from Barcelona to Kiev . The Cervignano del Friuli Intermodal Terminal is located in a central position in relation to the ports (Porto Nogaro at 11 km, Port of Monfalcone at 29 km, Port of Trieste at 48 km). maneuver personnel performed in self-production by Interporto, which provides for the introduction into the structure through the 610-meter maneuvering pole. The Intermodal Terminal is connected through the A4 motorway to the international airport of Trieste (Ronchi dei Legionari), whose traffic basin has regional significance. The distance between the two is 15 km. Intermodal terminal, 160 thousand square meters with 3 bundles of 2 tracks of 750 linear meters, equipped with road weighing and about 17 thousand square meters of canopy with two bridge cranes from 12.50 and 30 tons. Warehouses: 24 thousand square meters of covered spaces with an internal useful height of 10.30 linear meters, connected to the railway, equipped with hydraulic ramps, an external platform at the ramp level, an anti-fire sprinkler system, service offices and technical compartments. Directional building, with 2,500 square meters of operational and executive offices with modular spaces and availability of rooms. The company, with its employees and vehicles (opening hours from 07.00 to 21.00) is able to transfer from road to rail and vice-versa, both intermodal traffic and conventional traffic for different types of goods. It is also provided with authorization to move ADR / RID traffic. It is under construction a yard of 40,000 square meters, which will lead to a total of 60,000 square meters the area for car storage. The SECOND PHASE provided by the Detailed Plan, which extends from the west of the variant to SR352, includes a surface area for general services of 500,000 square meters, with the possibility of building 250,000 square meters. The initiative is expected to be implemented, in a manner subject to public nature, by individuals.